Viking Theatre will present Twelve Angry Jurors on Oct. 21-23. Press Release – Twelve jurors must decide the guilt or innocence of a young boy on trial for the brutal stabbing of his father in the Viking Theatre’s 2011 Fall Production of Reginald Rose’s Twelve Angry Jurors. Many people may be more familiar with Twelve Angry Men which originally aired as a CBS Studio One teleplay in 1954 before being turned into the Academy Award nominated film starring Henry Fonda. 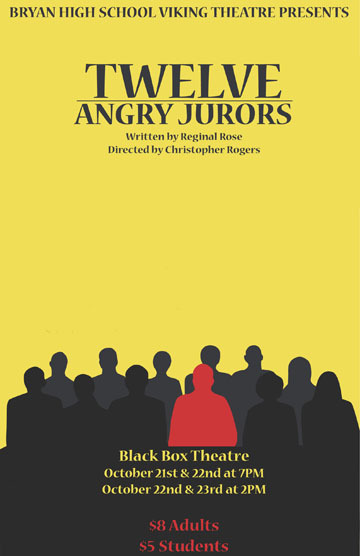 Twelve Angry Jurors tells the same story, but allows the casting of women since they are now allowed to serve on juries. Emily Franklin, a senior and Viking Theatre Thespian President, plays the roll of Juror Number Three who firmly believes the defendant is guilty. “I like how this play challenges you to rethink how you treat people and to not automatically judge people without considering their lives and what they go through,” Franklin said. Sophomore Elizabeth Garcia plays Juror Number Eight and is at constant odds with Franklin’s character. Jurors also marks Garcia’s first time onstage. “I wanted to be more involved at school. I thought it would be fun and I wanted to meet new people. I met senior Miranda Bennett,” Garcia said. Bennett transferred to BHS at the beginning of the year. Performances take place at 7 p.m. Oct. 21 & 22 (Friday and Saturday) and at 2 p.m. Oct. 22 and 23 (Saturday and Sunday) in the Black Box Theatre at Bryan High School. The Black Box Theatre is located in the back of the school by the Tennis Courts. Tickets are $5 for adults and $3 for students. Call 979-209-2515 for more information.